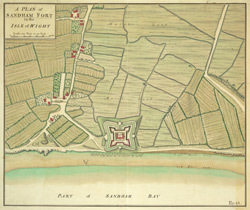 Coloured view of Sandown Fort not Sandham as the title suggests) and the surrounding area. The fort which is sometimes known as ‘Granite fort’, was built in 1862 to house eighteen, nine inch. It was situated close to the beach in the centre of Sandown Bay, on a rock eighteen feet above sea level. Originally it houses eighteen nine inch guns however it was felt that conditions were too cramped and some of these were replaced with smaller guns. Additional fortifications were built at Yaverland, Sandown Banks and Redcliff to support Sandown Fort. The fort was sold in the 1930s and a Zoo was established on the site.